This category encompasses several formats that are narrower that 35mm film. Often these formats are called subminiature since 35mm was originally called a miniature format compared to medium format films. 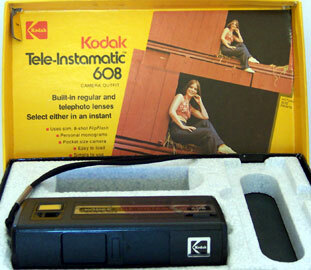 110 cameras were the new "instamatic" cameras starting in the 1970s drawing from the 126 market. 110 cameras were "new and improved" because they were small and slender taking very narrow 110 film cartridges similar to the prior 16mm film cartridges used in Minolta 16 Model P below. Like 126 film cartridges, the 110 cartridges were easy to load. Many 110 cameras had advanced features such as dual focal length lenses (tele and wide or normal) and built in electronic flash. 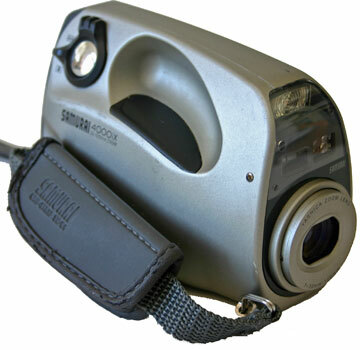 110 cameras also had a rectangular format allowing vertical or horizontal oriented photos (i.e. "portrait" or "landscape"). Unfortunately, the film size was too small for clear photos, especially clear enlargements. A 110 frame dimensions are 17mm x 13mm for an area of 221 square mm. 126 frame dimensions are 28mm x 28mm for an area of 784 square mm; over 3.5 times larger than the 110 frame area. 35mm frame dimensions are 24mm x 36mm for an area of 936 square mm, or 4.2 times that of 110 film. The development of 110 cameras therefore appears to have been primarily a marketing, rather than a technical, decision. The later disc cameras had even a smaller film area with dimensions of 10mm x 8mm = 80 square mm, about a third of the area of 110 film and a tenth of the area of 126 film. Disc cameras had a relatively short life. Kodak Tele-Instamatic 608 (1975) 25mm (f11) and 43mm (f11) lenses. Additional information at subclub.org. 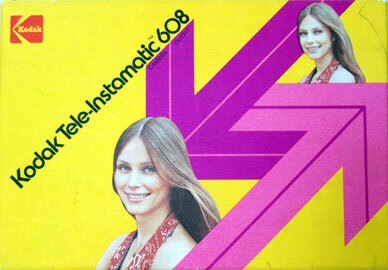 Kodak Tele-Instamatic 608, box cover very clearly from the 1970s. 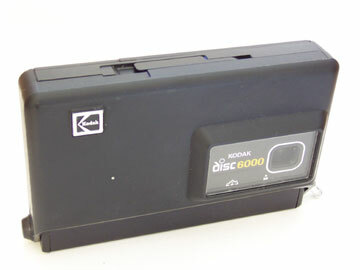 Kodak Disc 6000, sold from 1982 to 1984, takes HR-disc film (as opposed to VR disc film), list price $90 (Kodak History Site). This belonged to my parents. 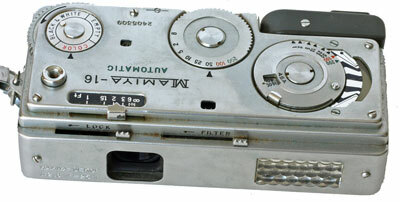 Large Image Mamiya-16 Automatic (1959) 16mm camera with dimensions of about 10cm x 5cm x 3cm. It is "automatic" only in the sense that it has a Selenium exposure meter, which has died with age in my camera. Shutter speeds from 1/200 to 1/2 second and Bulb. Focal length 25mm. Apertures from f2.8 to f11. Close focus 1 foot. ASA (ISO) to 1600. Made in Japan. Mine is in good cosmetic and working condition except for the meter. Purchased at a San Carlos (San Diego) garage sale on 11-18-07 as part of a group of several items. The seller was an 81 year old gentleman who was the original owner. Comes with gray leather case and gray leather braided hand strap. Very cool and high tech looking. Goes well with the space race, cold war spy camera era! According to submin.com list price in the United States in 1960 was $69.95, which is nearly $500 in 2007 dollars. See also subclub.org and Guide to Classic Cameras. 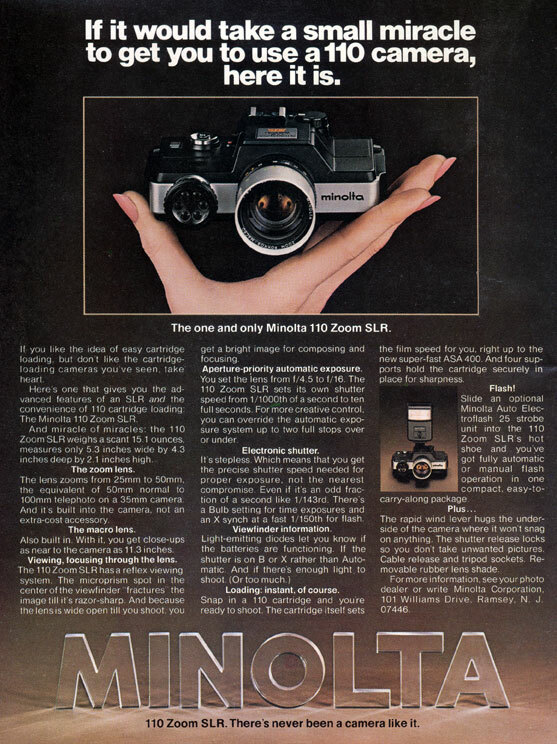 Minolta 110 Zoom SLR (1976) first single lens reflex 110 camera. Non-interchangeable 25mm to 50mm (50 to 100mm 35mm camera equivalent) f4.5 to f16 zoom lens with macro to 11.3 inches. Aperture set on non-through the lens light meter. Aperture preferred automatic exposure. Settings for A, X and B. X and B settings are manual. Automatic settings are electronic and stepless. Hot shoe. Takes two A76 batteries. Made in Japan. Serial no. 256729. Camera is in good cosmetic condition. Lens, mirror and focusing screen are clear. Focus and zoom work. The aperture generally works, although the openings at 5.6, 8 and 11 are not circles. I suspect these apertures may not be opening fully. The shutter opens but usually only after a second or two of pressing down on the shutter release. I suspect the shutter mechanism is sticking and needs to be cleaned and lubricated. The electrical system and exposure meter generally work in that the shutter fires on automatic mode and red and yellow (but not green) indicator lights come on in the viewfinder. The exposure adjustment switch works for -2 and -1, but it does not turn to +1 and +2. 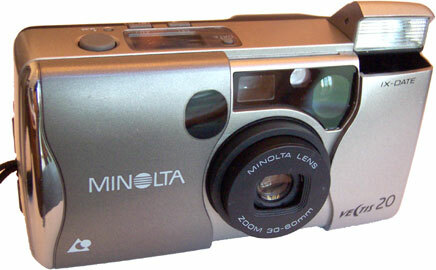 Several web sites discuss the Minolta. Minolta 110 Zoom, Wikipedia, www.submin.com, www.submin.com - manual, service manual and brochures, 110 Cameras, subclub. Subclub indicates the Minolta 110 Zoom SLR had shutter speeds of ten seconds to 1/1000 second. ISO could only be set for 100 and 400 but using the exposure adjustment switch allowed use of film speeds from ISO 25 to 1600. Subclub finally indicates this camera takes very sharp photos despite its small film size. Several sites refer to it as a sandwich camera because you hold it with two hands like you were eating a sandwich. While relatively large for a 110 camera, the "sandwich" design gives it a nice, stable feel with easy access to the shutter release with your right index finger and film advance under the camera operated with your right thumb. Purchased on eBay on 2-25-06 with four other cameras for a total of $4.95 plus $9 shipping (sole bidder). Came with Minolta Auto 25 flash that does not appear to work. The flash has significant corrosion on the battery door, but not elsewhere. The silver colored finishing on the reflector is flaking off. The flash does not fit on the hot shoe indicating there may be something wrong with the hot shoe. 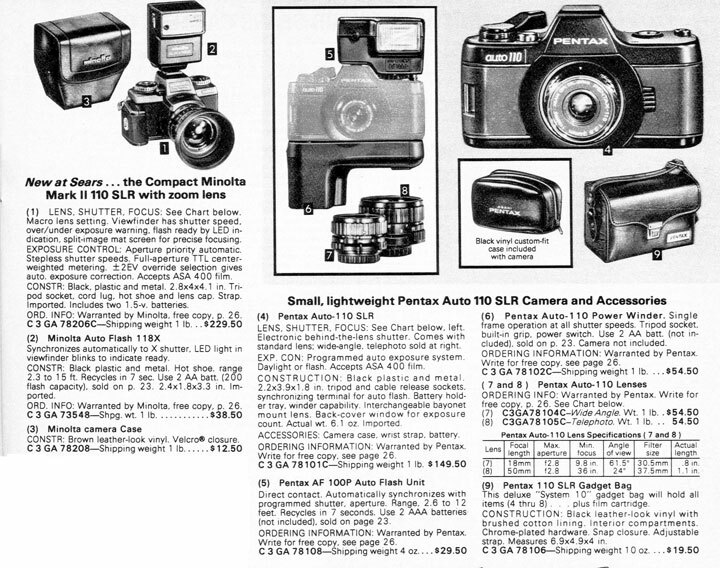 Price new in 1978-79 Sears Camera catalog was $189.50, over $575 in 2006 dollars. Additional information in full page ad from July 1977 Modern Photography Magazine. Minolta 110 Zoom SLR Mark II (1979) (Large Image) 110 single lens reflex film camera with non-interchangeable 25-67mm (2.7X) f3.5 Minolta zoom lens, 12 elements in 10 groups. According to www.subclub.org this is equivalent to a 50mm to 135mm zoom in a full frame 35mm camera. Specifications from manual: "Full-aperture TTL center-weighted" metering, "with pentaprism mounted CdS cell," Takes two 1.5v S-76 or equivalent batteries. Shutter speeds of 1/1000 to 1/4 second plus mechanical "X" (1/125 sec.) and "B." Aperture preferred automatic exposure. No manual control except exposure compensation of -2, -1, 0, +1, +2 stops. 85% viewfinder. Shutter speed indicated in viewfinder by LED lights. Hot shoe. Focusing to 1.1 meter. "Close-up range at 'Macro" setting." Manual states: "film-to-subject distances of approx. 890 to 200mm for respective image magnification on film of 0.07 to 0.19X." I'm not sure what the means. I roughly measure the close focus (subject to film plane) at Macro setting to be about 14cm (140mm) with the focal length set at 25mm. At 67cm focal length I roughly measure the close focus to be about 50cm (500mm or .5m). Pretty impressive close focus. Shutter release socket. Tripod mount. Removable action grip. Film speed automatically set. 40.5mm filter size. Weighs 485 grams. The price in 1980-81 Sears Camera Catalog was $229.50, equal to $609 in 2008 dollars. The price was comparable to a decent 35mm SLR at the time. For example, a Minolta XG-1 with 45mm f2.0 lens was $239.50 and came with a $25 rebate coupon. A Pentax K1000 with 50mm f2.0 lens was $159.50. Granted the 35mm SLRs did not include a zoom lens which was expensive at the time with a Sears 35 to 70mm f3.5 zoom selling at $189.50. The 35mm SLRs did, however, produce a negative which was 3.9 times greater in area. (110 film has a 17mm x 13mm frame for 221 sq mm. 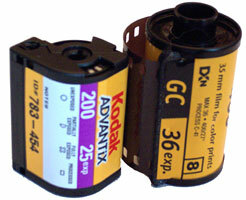 35mm film has a 24mm x 36mm frame for 864 sq mm. 864/221 is approximately equal to 3.9. You can also compare the areas to a medium format frame of 60mm x 60mm with an area of 3,600 sq mm or over 4 times that of 35mm film and 16 times that of 110 film. A Yashica Mat-124G sold for $179.50 at the time.) The Mark II is a very cool camera that feels nice in ones hands. In my opinion a 35mm SLR was a better choice, however, given 35mm film's larger negative and hence better image quality (other things being equal). My Mark II was a generous donation. It had belonged to the donor's father who passed away. After putting in two new batteries it seems to work like a charm. It still has film in it and I may just keep shooting with that film. It also came with a Minolta Auto 118X flash ($38.50 in 1980-81 Sears Camera Catalog) which works with new batteries despite prior battery leakage. Also included is a case ($12.50 in 1980-81 Sears Camera Catalog) and the manual. On page 25 of the 1980-81 Sears Camera Catalog with the Mark II, I have also included the competing Pentax Auto 110 camera which had interchangeable lenses. Minolta Pocket Autopak 200 (1977) Red, white and blue Bicentennial series markings. Subclub.org states 26mm f8 lens and two shutter speeds, 1/125 second for normal use and electronic flash and 1/50 second for Magicube. Hot shoe on one end for electronic flash or Magicube on top. According to subclub.org it uses a 1.4 volt PX 640 mercury battery. I believe battery compartment is near hot shoe, but I can't get door loose. I'm not sure what the battery is for or whether the camera has a light meter. Two zone focusing: One person for 3 to 6 feet and three people for 6 feet to infinity. ISO 100 only. Made in Japan. Serial no. 647326. Good cosmetic condition. Works except shutter is slow to close. The hot shoe worked triggering an electronic flash. Purchased on 9-20-05 on eBay for $4.50 with $2.67 shipping. Nice case and carrying cord included. Minolta Autopak 460TX, a relatively sophisticated 110 camera with several features. Excellent information at subclub.org. Switchable 28mm (f3.5 to 8) and 43mm (f4.7 to 13.5) lens. Focus by estimation with illuminated focusing scale on top of camera. Close focus 3.3 feet. Shutter speed 1/200 second. 100 or 400 ISO film. Exposure settings for sunny, cloudy or flash. The sunny or cloudy change the aperture. Built in electronic flash. Takes one AA battery. In good cosmetic and working condition although curriously five of the screws on the outside of the camera are missing. Made in Japan. Serial no. 1571957. I think I got this on eBay in 2004. Minolta Pocket Autopak 70, surprisingly has many sophisticated features. Subclub.org states it has a 26mm f3.5 lens, very fast for a 110 camera. It also has five zone manual focusing using pictograph symbols corresponding to 10, 3.5, 2, 1.2, .9 and .5 meters. Electronically controlled shutter speeds from 10 seconds to 1/333 second. Cds light meter. K type battery which goes in the far left side of the film compartment. Sliding closeup lens providing close focus to 50cm. Tripod socket and cable release socket. Magicube socket. No hotshoe. In good cosmetic condition (some scratches on top and "passed" sticker worn off). Unsure of working condition. Shutter will not fire, but it is apparently electronically controlled and I do not have a K battery. I forget where I acquired this camera. Made in Japan. Serial no. 135114. Minolta Weathermatic A, a submersible camera. Excellent information at Subclub.org. It has a 26mm, f3.5, 4 element lens with continuous focusing from three feet to infinity by estimation using pictographs on large knob on right top of camera. To the left of this is a similar knob for setting the aperture - sun, cloudy and flash. One shutter speed of 1/200 second. ISO 100 and 400. Powered by one AA battery. A water tight cover with large O ring covers the entire back of the camera where the film and battery compartments are. The camera is rated to 5 meters below the water surface. It has an integral electronic flash. The film advance lever is on the bottom. It is made of bright yellow plastic and has a look similar to the later Weathermatic Dual 35 in the 35mm non-SLR section. In excellent cosmetic and working condition. Included in the purchase of a Praktica MTL 3, Pentax Spotmatic and three lenses for $25 at a garage sale in the Fall of 2005. Minolta 16 Model P (1960-1965) A subminiture 16mm format preceeding 110 film. The Kodak developed 110 film was actually a 16mm design, but with spocket holes. See photo under Model P-s description for comparison. 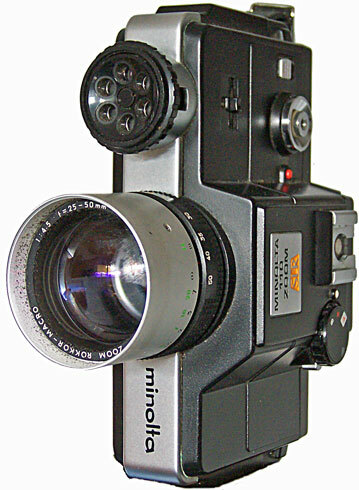 Minolta was a leader in the 16mm format. The camera used reloadable cartridges. 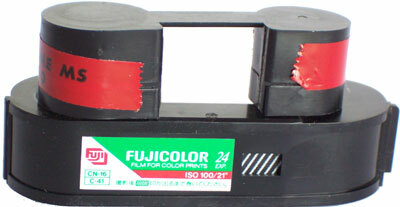 Since 16mm film is still available, it is still possible to reload the cartridges. A detailed description of the Minolta 16 Model P is given at subclub.org. It was a less expensive version of the prior Minolta 16. The camera has one shutter speed and apertures from f3.5 to 16 with a pictograph system to determine the proper exposure. Mine was acquired as part of a lot of items for $5 at an estate/garage sale. The lot included three tripods, a Kodak 110 camera, a Minolta non-SLR autofocus 3X zoom compact 35mm camera, a case for the compact 35mm camera, a meter stick and three metal cases of 16mm slides taken by the decedent! The camera appears to be in good cosmetic and operating condition although the latch for the film compartment appears to be broken. It still closes. Several months later at another garage sale I acquired an empty box and several empty film cartridges. Minolta 16 Model P-s (1965-1972) Large Image) Very similar to the Model P. Indeed, there is no "s" designation on the camera. 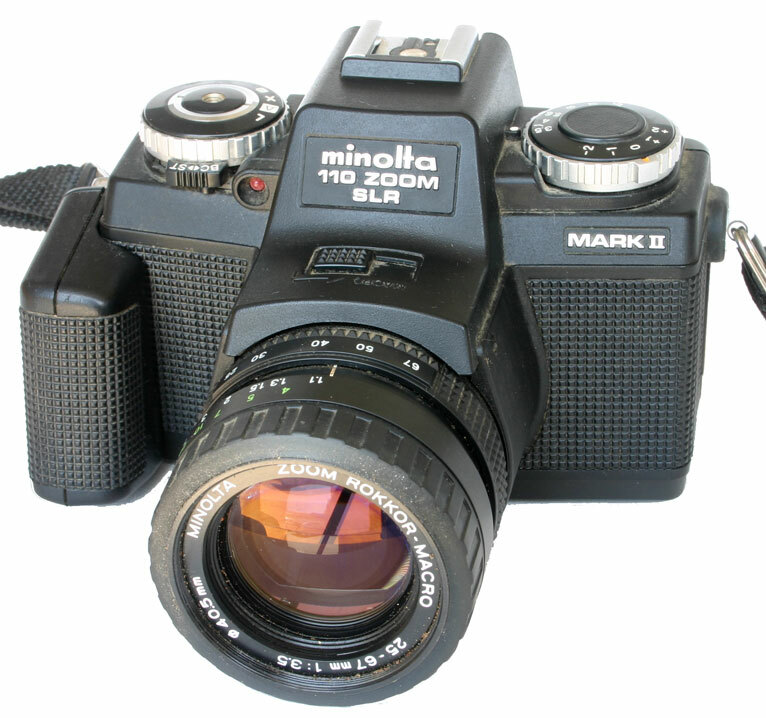 The main difference according to Submin.com is that the Minolta-16 Model P-s has a lever in front which switches the shutter speed from 1/100 to 1/30 second. While this is primarily to use a flash, it can also be used without a flash. It hence gives the camera two shutter speeds instead of the one shutter speed of the Minolta-16P. The Model P-s also has a flash socket on the side nearest the viewfinder. Apertures are 3.5, 4, 5.6, 8, 11 and 16. ASA (ISO) settings of 25, 50, 100 and 200. Little icons show bright sun, hazy sun, cloudy bright and cloudy dull. The camera is all mechanical and has no exposure meter. It is fixed focus. The price in the Leedar Photo Supply Photographic Catalog 1967 was $25.50, or about $160 in 2008 dollars. The manual is available at butkus.org. I purchased my Model 16-Ps on 3-24-08 for $5 in the North Park area of San Diego through an ad on Craigslist. It is in excellent working and cosmetic condition. It comes with a green plastic case. Large Image Minolta 16 QT (1972) According to Submin Club, the Minolta 16QT was the last of the Minolta 16mm cameras and arrived just before Kodak changed the market with the introduction of 110 film. The two shutter speeds of 1/250th and 1/30th (for low light or flash) are adjusted by a lever on the top of the camera. The 23mm lens has apertures from f3.5 to f22 adjusted with ring on top. It is the only Minolta 16mm camera with adjustable focusing. There are four zone focusing icons for head (4 feet), upper body (7 feet), full person (12 feet) and mountain (30 feet +). The focusing slide lever is on the bottom of the camera. Film speeds are ASA (ISO) 50, 100, 200 and 400. Film advance is with a thumb wheel on top-right-rear of camera. 12mm x 17mm negative size compared to 13mm x 17mm for 110 film. 18 exposures. The manual is available at butkus.org. The camera can be operated without the battery. The battery operates the light meter. You set the shutter at 1/30 or 1/250. You then adjust the aperture ring with the circuit button down until the two arrows in the viewfinder say OK. The circuit button is really an integral part of the aperture ring. My camera is in very good cosmetic condition. It comes with its case in fair condition. My camera works, although initially the shutter was not firing and it still seems a little fussy. The battery is a large PX30 battery or 2 PX-825 batteries. These 3 volt batteries are hard to find. You can, however, apparently use a 3 volt button battery like a CR2450 with pennies used a spacers. I haven't tried out the meter yet. I purchased my Minolta 16 QT with a Polaroid Polavision camera and viewer, a Minolta SRT 101, and some other items for a total of $30 from an ad on Craigslist for the Polavision Viewer in the North Park area of San Diego on 5-10-10. Minolta Vectis 20 (circa 1997) APS camera with 30 to 60 mm f4.0 lens with 7 elements in 7 groups. Close focus .4m. Dimensions 113.5 x 59 x 37.5mm. 170g. See introduction regarding Advanced Photo System. In excellent working condition. Purchased on eBay on 12-15-05 for $3.75 with $3.85 shipping. Actual shipping was $5.75 from Anchorage, Alaska. Three rolls of 25 exposure APS film, Tam Sport compact case, CR2 3 volt lithium battery, instruction manual and warranty card included. Warranty card states it was originally purchased on 5-10-97. Photo above compares APS and 35mm film. Serial no. C8603676. A review at ecoustics.com refers to purchasing one around 1999 for $180 at K-mart. Minolta Vectis S-100 (Large image) from date on manual from Minolta, introduced around 1997. It is a relatively sophisticated single lens reflex, autofocus, Advanced Photo System (APS) camera. Shutter speeds from 1/1000 to 30 seconds. Shutter preferred, aperture preferred and program exposure modes in addition to five "subject program modes." No manual exposure mode, although exposure compensation is possible. Built in flash which automatically pops up in automatic mode. Date imprint. Splash proof. Takes two CR-2 batteries. Interchangeable Minolta V series lenses which are not the same mount as Minolta Maxxum. Some of the lenses have a manual focus button. My camera has the standard 28-56mm f4-5.6 lens with no manual focus button. At epinions.com a reviewer refers to getting one new at the reduced price of $200 in 2001. I think they were significantly more expensive earlier. It has all the usual Advanced Photo System features including three formats and drop in film loading. 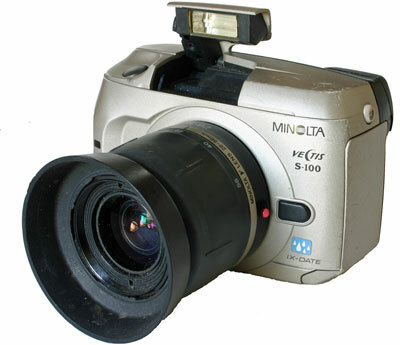 Minolta also made a S-1 which was more advanced. "APS - Variations in Minolta Vectis Subminiature Cameras" has a complete listing of the Vectis series. My S-100 was purchased at a garage sale in the San Carlos area of San Diego on 3-22-08 for $5 with a Polaroid Spectra AF camera with two rolls of film and large gadget bag. My S-100 is in decent cosmetic condition with several scratches especially in the upper right front and top. It seems to work fine and the lens is clear. 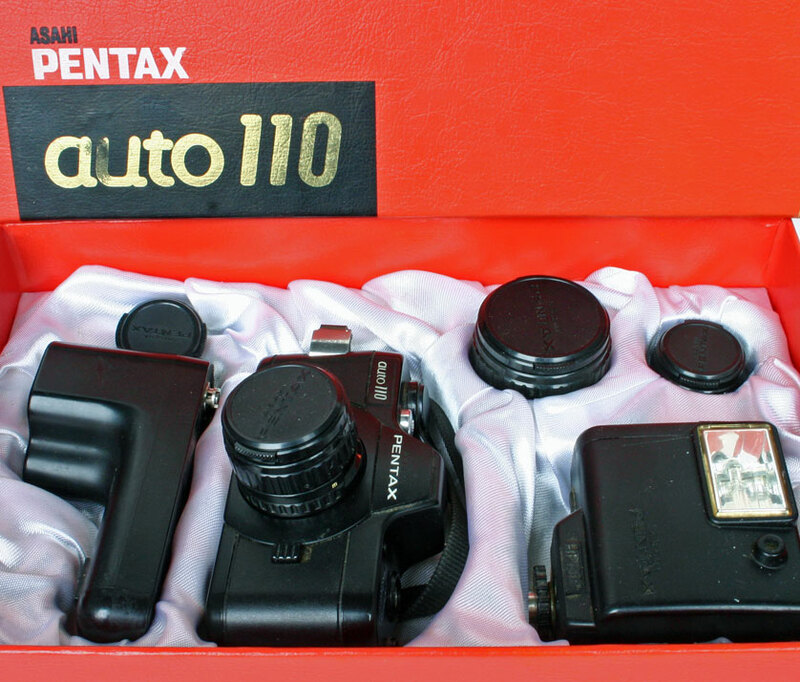 Large Image, Kit Pentax Auto 110 (introduced 1978) this and the later Pentax Auto 110 Super were the only 110 cameras made by Pentax, to my knowledge the only 110 single lens reflex cameras with interchangeable lenses, and to my knowledge the smallest single lens reflex cameras. The body measured only 56mm high x 99mm wide x 32mm deep (2.2" x 3.9" x 1.3"). The standard lens increased the total depth to 45mm or 1.8". The body weighed only 159 grams (5.6 ozs.) or 172 grams (6.1 ozs.) with the standard lens. It looks very much like a toy version of a 35mm single lens reflex camera. They had programmed through the lens metering. No manual, aperture preferred or shutter preferred modes were available. The shutter and aperture blades are combined in the body. The lenses therefore do not have a separate aperture adjustment. All maximum lens apertures were f2.8. A kit was available with three lenses: 18mm, 24mm, and 50mm, equivalent to 35mm, 50mm and 100mm in a 35mm film format. In 1981 three other lenses were added: an 18mm fixed focus lens, a 70mm lens and a 20-40 zoom lens. The film advance on the auto 110 requires two strokes. This was reduced to one stroke on the Auto 110 Super. The Auto 110 a very cool little camera, but I question the wisdom of making such a sophisticated camera for such a small film format. The price in the 1980-81 Sears Camera Catalog was $149.50 with the standard 24mm f2.8 lens. $149.50 then is equal to $397 in 2008 dollars. 18mm wide angle and 50mm telephoto leneses, as well as a power winder, sold for $54.50 each. The Pentax AF 100P flash was $29.50. The kit, at least purchased separately, would have therefore more than doubled the price. I purchased my kit, including the body, three lenses, flash, winder, original box and owner's manual, for $50 in National City, CA on 1-6-08 from an ad on Craigslist. It was a little dirty, but everything, including meter, appears to work, except I have not yet gotten the winder to work. Many sites have excellent information including: subclub.org, cameraquest, and Wikipedia. 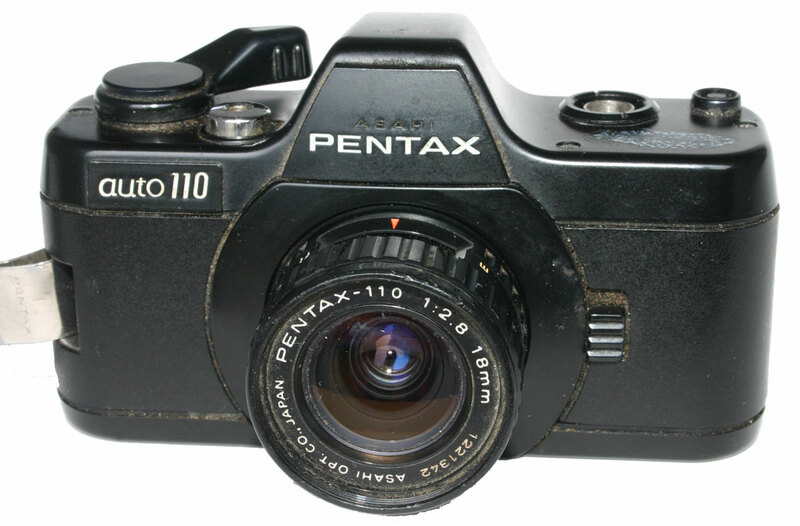 On page 25 of the 1980-81 Sears Camera Catalog with the Pentax Auto 110Mark II, I have also included the competing Minolta 110 SLR Mark II camera which had a non-interchangeable zoom lens. 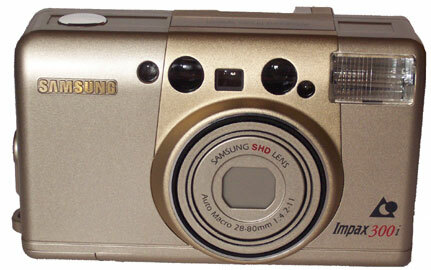 Samsung Impax 300i, APS camera with 28-80, f4.2-11 zoom lens. Shutter speeds 1/3 to 1/400 seconds. Purchased on eBay on 12-11-05 for $1.26 with $5.53 shipping. The camera is in like new condition. Like new manual and a new CR2 battery included. It turns on and the zoom works. The manual says the camera does not fire without film, however. Samsung is a Korean company and the camera was made in Korea. The earliest reviews at Amazon.com are in January 2000. It is still for sale at some places on the Internet. "Regular" price at one site was $200 on sale for $100. Another site lists it for sale at $170. Samsung Electronics is huge electronics firm making a variety of products such as plasma and LCD televisions and monitors, camcorders, cameras, and household appliances. According to Wikipedia - "Samsung Electronics", "In 2005, Samsung overtook Sony as one of the most valuable brands, and is now ranked #20 in the world." Vivitar Tele 603, 24mm/36mm f7 glass lens, fixed focus, fixed exposure. Purchased for $1 at garage sale on May 28, 2005, with display case. In good operating condition including electronic flash. Made in Japan. According to Sub Club, 1/125 shutter speed, with focus range of 5 feet to infinity. Two aperatures - f7 (no flash) and f11 (flash). Apparently from 1977. 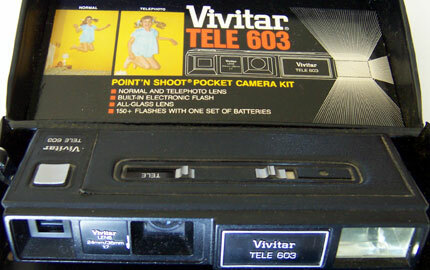 Vivitar Tele 815, belonged to an aunt. 24mm/48mm f5.6 lens, fixed focus, fixed exposure. Made in Korea. 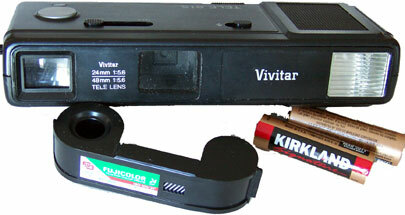 Shown with exposed film cartridge and batteries for electronic flash. Battery compartment shows some leakage and flash does not work. According to Sub Club, 1/125 shutter speed, with focus range of 5 feet to infinity. Dates from 1985 according to that site. 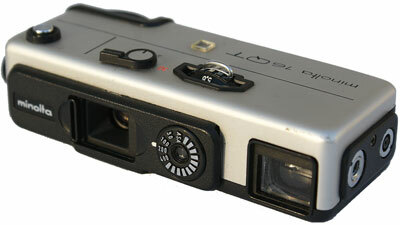 It is also listed in the Sears 1980-81 Camera Catalog, however, with a price of $42.50. The catalog states 1/250 second shutter speed and minimum focus of 5 feet. $42.50 in 1980 is equal to about $113 in 2008 dollars. Large Image Yashica Palmatic 20 (1974) The specifications in the included owner's manual indicate: 110 film camera with a negative size of 13mm x 17mm, a 26.5mm f9.5 3-element optical glass lens, fixed focus of 5ft to infinity, a mechanical shutter with a daylight speed of 1/120 second, uses "batteryless Magicube" with a flash photography distance of 5 to 10 feet, optical glass viewfinder and tripod socket. See also Subclub.org which also indicates the shutter speed with flash is 1/60 second. Yashica-Guy.com in it's battery chart of all Yasishica cameras indicates the Palmatic 20 was sold in 1974 and had no battery. The manual also indicates the standard print size was 3.5" x 4.5" with color enlargements up to 5" x 7". The camera takes 12 or 20 exposures. The warranty in the manual is not by Yashica. Rather it is waranted by IMC Division, Interphoto Corp., 220 Clay Avenue, Lyndhurst, N.J. 07071. It is made in Japan. I'm curious if the camera was made by Yashica or someone else. My first Palmatic 20 camer in a Kodak case which fits it exactly. The camera has dimensions of about 5" x 2.25" x 1-1/16" (about 12.7cm x 5.5cm x 2.7cm). The inside of the box states: "Yashica Palmatic 20 Because . . . -It takes Better Pictures. -Flash Shooting requires NO batteries. -Drop-in Film Loading is sure and simple." I purchased two of these. The first one was purchased with about 7 other point and shoot cameras from the 50s to 70s for $25 at a La Mesa, CA garage sale on 1-16-10. It is in excellent condition and came with the owner's manual. I purchased the second one on 1-18-10 on eBay on 1-18-10 for $4.99 (Buy It Now) with $10.92 shipping from Pittsburg. That's pretty high including the shipping for a very simple 110 camera, but the eBay sale included the original box which I will have photos of when I get the camera. The camera (and many others like it) is a good example of marketing very compact and simple cameras, although a poor overall design since, like many other 110 cameras, the lack of adjustiblity and the very small negative size limits its ability, in my opinion, to take better pictures. Yashica Samurai 4000ix, Advanced Photo System (APS) camera with 30mm to 120mm zoom lens. Viewfinder (not through the lens) viewing. Autofocus. 3V 123 battery. A nice camera with a wide zoom range but relatively small maximum aperature especially at the long end of the zoom ranging from f4.5 at 30mm to f9.9 at 120mm according to the following Japanese site. It is shaped and styled like a camcorder. About 8cm heigh, 11cm long and 5cm wide. Lens extends out an additional 6.5cm from the front when at 120mm focal length. Assembled in China of parts made in Japan. The Japanese site above gives a date of 1998, which I am guessing is when it was first sold. Most of the entries on the Internet were European or Japanese sites. Therefore, I'm guessing this specific model may not have been sold in the US. There were many Yashica Samurai models, several of which were half frame 35mm format. I purchased this on 7-7-07 for $5 at a La Mesa, CA garage sale. It has some scratches on the body, but it appears to be in working condition. I can't figure how to open the film compartment, however.